There's a song the young primary kids sing at our church. 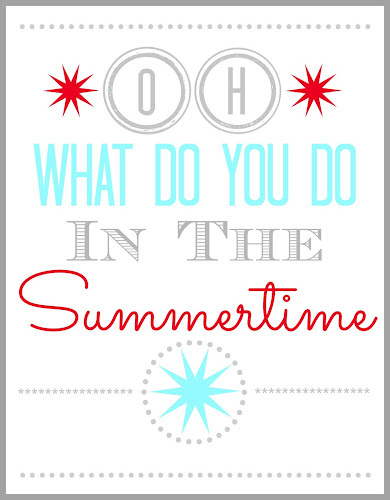 It's called Oh, What Do You Do In The Summertime? I remember singing it when I was little, and it always makes me think of long, carefree summer days. The song talks about counting the stars in the sky, fishing in streams, swimming, tree climbing, cloud watching, parades, lemonade, all the classic summertime activities. My boys and I made a summer bucket list (at least half of a bucket list, we have more to add) and I think it would be fun to take pictures of all our activities, print them out, hang them clothesline style on a wall, and then put the Oh, What Do You Do In The Summertime? printable above it (I'll try and post a picture of it when I get it all set up). 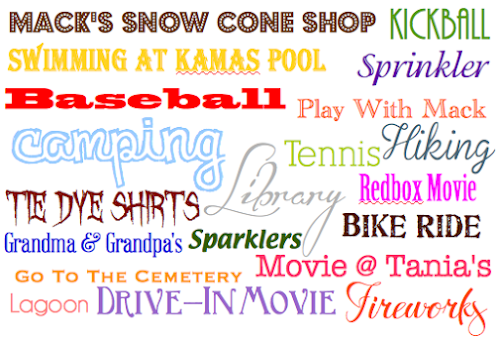 What are your favorite things to do in the summertime? Hi, Julie! I'm so glad you liked the printable. Thanks so much for visiting. Come back anytime! I love it! Thanks for the printable! I love anything summertime! Glad you liked it. Thanks so much for stopping by and for your kind words. Have a wonderful day! Hey, Jamie! You're a busy lady with all your kind comments- thanks so much! Have a great day!